Robbie Hart (Sandler) is the ultimate master of ceremonies... until he is left at the altar at his own wedding. 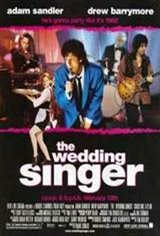 Devastated, Robbie becomes a newlywed's worst nightmare -- an entertainer who destroys other people's weddings. It's not until he meets a warm-hearted waitress named Julia (Barrymore), that he starts to pick up the pieces of his heart. The only problem is Julia is about to marry a stooge, and unless Robbie can pull off the performance of a lifetime, the girl of his dreams will be gone forever.